In 1897 build as a holiday home "Villa Muegge" wih a tenniscourt in the garden, since then there have been many functions for this house; in the fifties is was it a "Biergarten restaurant" en later on a Eintopf restaurant "Bremer Ferienheim"
In the seventies it is transformed to a retirement home "Goldener Herbst" with custumers all over Germany because of the healthy and clean air. 2014 it is bought by the brothers Ros from the Netherlands and changed in a holiday home again. The brothers like to show as much as possible original elements from the earlyer periods. Such as; The food elevator, the vinyl flooring, of the 'Goldener Herbst"
Altenau is an little mountain village in the middle of the Hochharz, living from the silvermining in the past. In the last century tourisme became important because of the beautiful mountains and many hikingpaths. There is a free nature swimmingpool between the hills and a large wellness, swimming and sauna center in the town. The largest Herb garden in the world is in Altenau (we did not cheque that!). There is a lovely old wooden church, a bakershop, 3 butchers, a supermarket and about 15 restaurants and an brewery! Near the house is the "Tourist Information" where you can get every information about the Harz, you can take brochures, look at video's about the Harz or ask anything at the people behind the desk. Hiking paths starting all around Altenau. 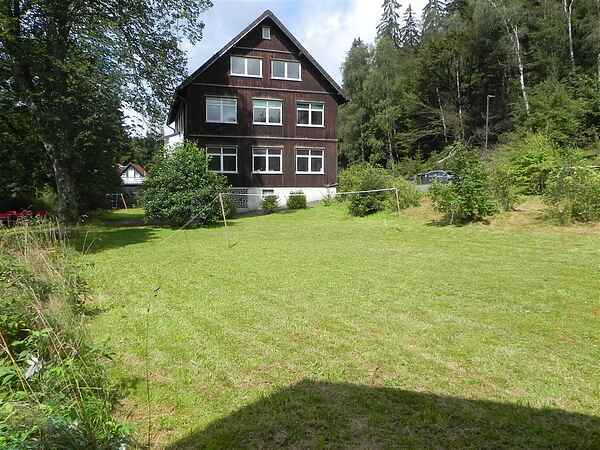 Welcome in Oker13, the specious holiday villa situated at the border of Altenau, a little mountain village in the Hoch Harz. Oker 13 is surrounded by a 2000m² garden bordered by the river Oker and the mainroad to the lake and to the middleaged "Kaiserstadt" Goslar. On the opposite of the street is the "Schwarzenberg" a startingpoint of interesting hiking and mountainbike paths including one to the "Brocken", with 1141m the highest peak in the Harz. The accomdandation at Oker13 featured interesting "vintage" furniture from the 60ties and the 70ties design, with modern comfort boxspring beds and comfort seating. also the kitchen, that was used in the sixties in the cellar for the "Biergarten" moved upstairs to the first floor. The villa is situated at an attitude of 550m and has large rooms with high cealings and large windows that all can be openedto let in the healthy air. Tourist information, shops restaurants and bus stop can be reached by foot. It is living in nature with all facilities very near by. This is wat you rent; 220m² as shown on the 3 drawings of the site.You use a own frontdoor and if you rent, there will be no other rentals in the house.